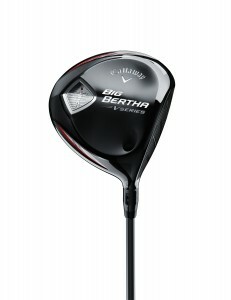 Callaway Golf’s new Big Bertha V Series driver will be available beginning Aug. 22. The company says the driver features an aerodynamic design, lightweight materials, hyper speed face, refined components and lower drag. The combined technology, according to Callaway, means the Big Bertha V Series driver is built for speed. For Callaway aficionados, the driver bears a striking resemblance to the original Big Bertha design of more than 20 years ago. It’s good to have the old girl back with fresh technology. Callaway says the Big Bertha V Series driver (suggested retail price $399) weighs as low as 290 grams for more club head speed. The aerodynamic shaping lowers drag through the entire swing to give you the player more club head speed. A Hyper Speed Face, the company says, produces higher ball speeds all across the face and the lighter Forged Composite material in the crown leads to higher swing speed and ball speed. Callaway says the Big Bertha V Series driver was built particularly for players with slower swing speeds, but it can be used by players of all skill levels. For example, PGA Tour players Patrick Reed, Harris English and Matt Every each put the driver in play at the recent WGC Bridgestone Invitational. Big Bertha V Series will be available in lofts of nine, 10.5 and 13.5 HT options. The nine-degree driver will have a Speeder 565 Shaft and the 10.5-degree and 13.5 HT drivers each will have a 42-gram Mitsubishi Bassara shaft.